The winning selection of mushrooms! 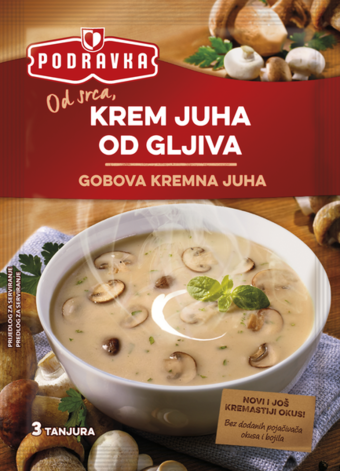 Finely selected champignons and porcini mashrooms is the basis of this semi-thick aromatic soup, and fine composition of spices makes the full taste for everyone who wants to get the best of mushrooms. Suitable for vegetarinas, can be prepared in an flick of an eye: one package can provide you with 4 plates of delicious soup in only seven minutes! An ideal supplement for preparing other, more complex dishes like lasagna with mushrooms. Preparation: Empty the contents of the package into 1L of lukewarm water. Stir with a whisk until the soup boils. Simmer for 7 minutes stirring constantly. Add a tablespoon of sour cream at your choice. Ingredients: wheat flour, skimmed milk powder, table salt, vegetable fat, corn starch, dried mushrooms 7,5% (porcini, champignons), flavour enhancers (monosodium glutamate, disodium inosinate), dried onion, vegetable oil, spices, lactose, parsley leaves, milk proteins, acid (citric acid). May contain traces of milk and eggs.